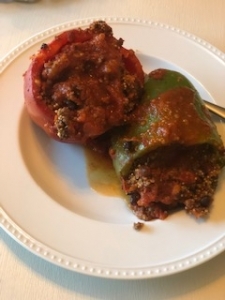 I am a huge fan of stuffed peppers and with this recipe you can make everything in one pan before warming in the oven. I used ground sausage for this recipe; you could also use ground turkey. Pre-heat the oven to 400 degrees. Cut the top off your peppers (I used 4) and place into a dutch oven. 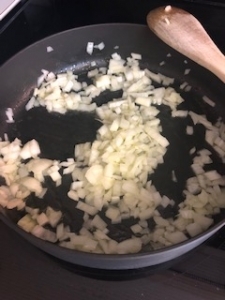 Start by using a large pan, heat olive oil over medium heat and cook onions until soft. Add minced garlic and cook about 1 minute. 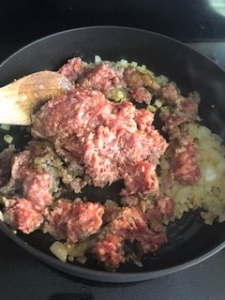 Add ground sausage and cook until the sausage is browned. Then, drain grease. 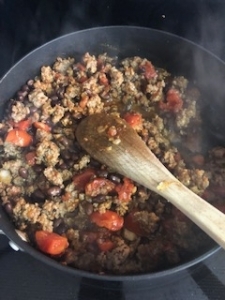 Add black beans, tomatoes, oregano and salt and pepper. Add uncooked quinoa and chicken stock to the pot and stir well. 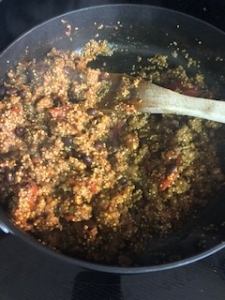 Allow the mixture to cook together until the quinoa is completely cooked– about 20 minutes. Your mixture will be thick but juicy. 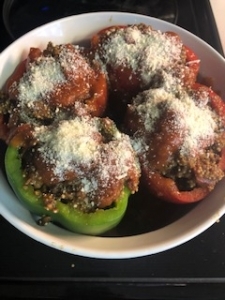 Scoop the sausage quinoa mixture and pour it into the hollow peppers, making sure to fill the peppers completely but allowing the mixture and juice to spill over the sides. 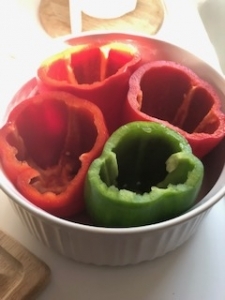 Once all peppers are filled, pour remaining juice into the bottom of your pan or Dutch Oven. Put the pan into the pre-heated oven and cook for approximately 30 minutes or until the peppers are tender. Once finished, pull the cooked peppers from the oven and top with grated cheese and cook for an additional 5 minutes. Enjoy! Ingredients – I got the recipe here!